Grandpa’s Cabinets has been known primarily for building custom display cases for models of all varieties including ships, cars, planes, diorama’s, dolls, soccer gloves and just about anything you might think of. Well, besides these, I also build furniture and anything related to wood. 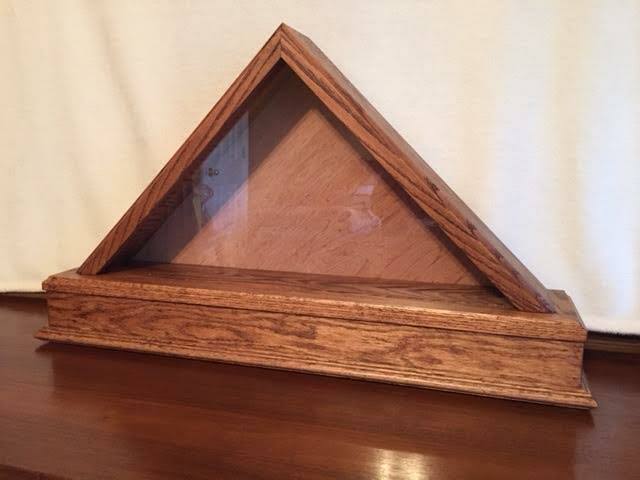 One of the things I offer and custom build is the Memorial Flag Display Case. I offer either red oak or cherry solid hardwoods and I finish with any stain color a customer might desire. The flag size I make these to house is the 5 x 9 foot size that’s normally draped over the coffin of a deceased veteran. 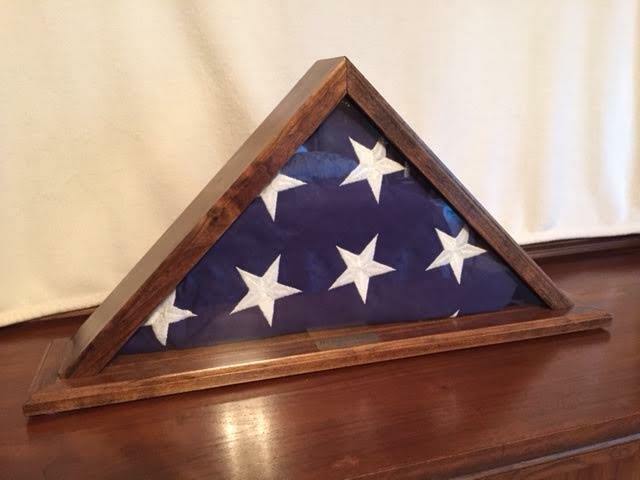 This one shown here I made for my father who was a WWII vet who served from D-Day, Omaha Beach right on through to the end of the war in Germany. I also offer brass plaques with personalizations to suit any customer’s requirements or desires. I mounted one memorializing my dad as shown below. Recently a customer asked for a flag case for their relative who recently passed but they wanted a different twist in the base. They wanted to be able to display a plaque on the front face of the base so it could be seen from afar. 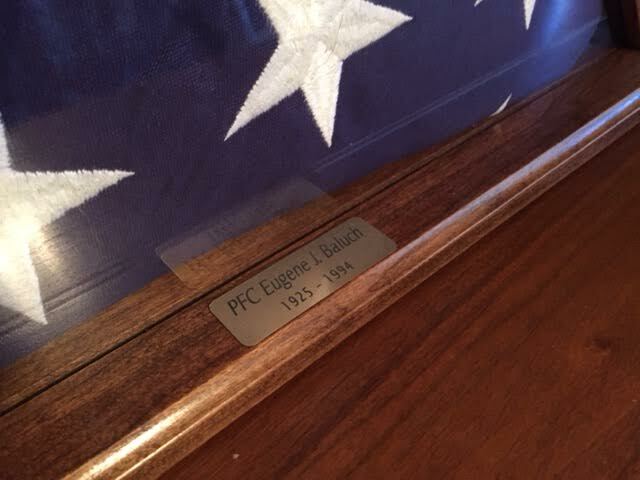 We determined they needed an area on the front of the base of 2″ to mount a plaque that was 1 1/2″ high. I designed this alteration to my usual case, which wasn’t an issue since I build everything custom to any customer’s specs, to include a base with some additional moldings. It gives the customer a place to mount their plaque and also gives the flag a more prominent display wherever they might choose to place it. Grandpa’s Cabinets offers these cases and the cost for the standard case is $89.00 plus shipping and applicable taxes and for the case with the larger base, $119.00. These are hand made, custom, and if interested, contact Ron Baluch at ron@grandpascabinets.com and please visit my site, www.grandpascabinets.com for information on everything I offer. I have received the flag case today. Absolutely astounding work Mr. Baluch. We couldn’t be happier. Thank you many times over for your work of excellence. It will be an heirloom in my family for a lifetime. God bless you with much favor and extended health. I just received a replacement display case from Grandpas Cabinets for one that was destroyed in shipping last week. All it took was a quick phone call to Ron Baluch explaining the condition the display case arrived in, he promised to start a replacement that weekend and get it shipped Monday. True to his word the case has arrived in excellent condition and is more then what I had expected, great workmanship and efforts for customer satisfaction.